The world’s greatest 4-Wall handball players and Race superstars kicked off the Simple Green U.S. Open “Festival of Handball” and WPH R48 IV Stop #1 on Thursday. While the top seven seeds received byes into the round of 16, the rest of the 25-man field battled in the round of 32 for a spot in the Sweet 16. Eighth seeded Anthony Selestow dispatched Alfredo Herrerra, while the Olympic Club’s Erik Torres dismantled Jonathan Hingey. Selestow will face Houston R48 III finalist Diarmaid Nash, who was nearly upset by 3-Wall big ball star Gilberto “Boxer Rosales. Jonathan Iglesias battled Ireland’s Brendan Fleming for nearly three hours before finally advancing in a tiebreaker, while Abraham Montijo cruised past Canadian Danny Bell. Torres will face Luis Moreno, Iglesias will face Mando Ortiz, and Abraham Montijo will face Naty Alvarado in the round of 16. In the bottom half of the draw, Shorty Ruiz knocked off Danny Armijo to setup a showdown with Paul Brady, Charly Shanks defeated Christian Luna to setup the most highly anticipated round of 16 match with Sean Lenning, and Stephen Cooney outlasted Adam Bernhard to setup a match with Emmett Peixoto. David Fink faces Luis Cordova in the eighth round of 16 match of Thursday night. Paul Brady survived an early first game scare in his first match against Shorty Ruiz, trailing 14-7 before calling a timeout and rattling off 14 consecutive points to take game one. Brady cruised in game two, setting up a quarterfinal showdown with Luis Cordova, who defeated sixth-seeded David Fink in two games. 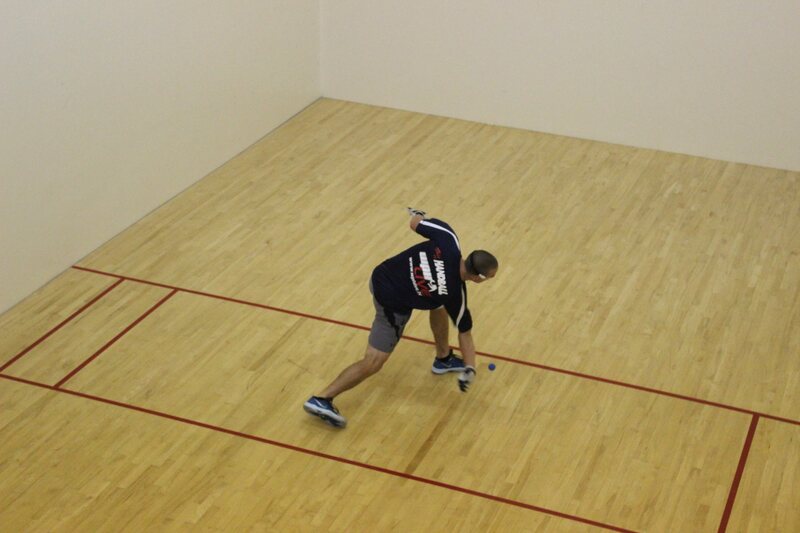 Top seed Luis Moreno encountered little resistance against the Olympic Club’s Erik Torres, easily winning in two games. 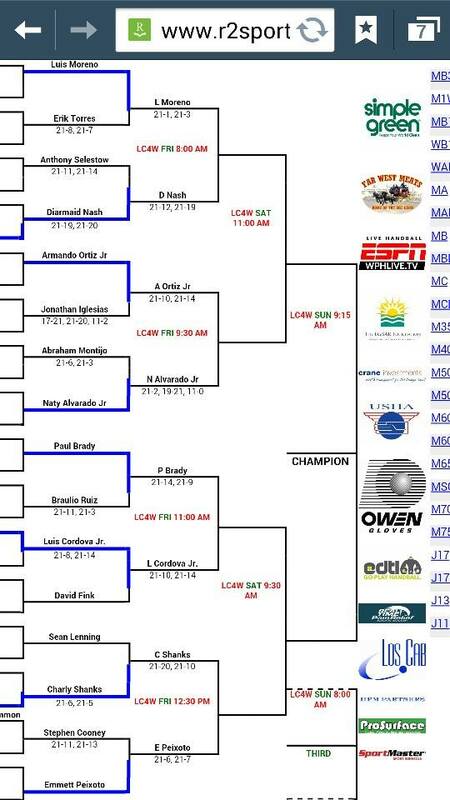 Moreno will face Diarmaid Nash in the quarterfinals for the second consecutive year at the Simple Green U.S. Open. Nash overcame Anthony Selestow in two entertaining games to advance. Emmett Peixoto had little problem dispatching Stephen Cooney to advance to his first Simple Green U.S. Open quarterfinal since 2012. Peixoto will face Charly Shanks, who overcame a 14-20 deficit against Sean Lenning in game one to seize the momentum and coast in game two. Naty Alvarado nearly shutout Abe Montijo in game one of their rematch from the Plummer Bash two weeks ago, then dropped game two. Alvarado regrouped and ran 11 straight points in the tiebreaker. Mando Ortiz defeated Jon Iglesias in two games to setup a clash with his fellow Southern Californian Naty Alvarado. 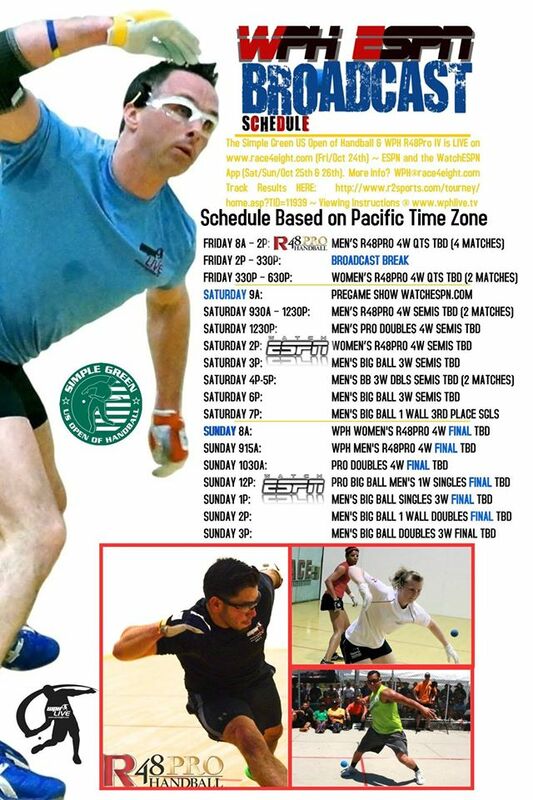 Tune in tomorrow on race4eight.com to watch all of the exiting men’s and women’s 4-Wall quarterfinal action live from the Simple Green U.S. Open and watch all of your favorite indoor and outdoor handball stars live on ESPN and the WatchESPN App all weekend by going to http://espn.go.com/watchespn/.